Mint Green: Eat It Up or Spit It Out? 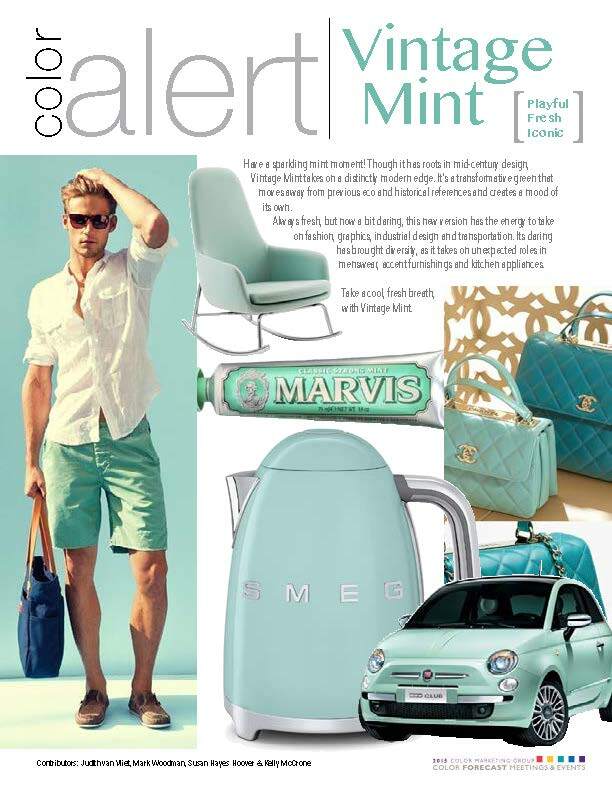 Color Marketing Group just presented Vintage Mint for their monthly color feature and I love it. Now I know that this is a very hard color to sell for the home because I try it all the time with my clients and it’s always a no. It’s not that they don’t like the color but it’s that the color doesn’t match anything in their home and it will be really expensive to change. I happen to have it in my home, guest room to be exact, and it looks really cute. Now the tricky thing about this color is that more than likely, it will not match your kitchen tile, or flooring in your home. What’s the culprit? The yellow undertone of most wood floors and standard kitchen tiles and the dreaded pinky undertone in many Contractor grade carpeting. However, if you’re lucky enough to have dark, rich wooden floors then this minty green will look awesome! I plan on redoing the flooring in my home so my patina and mint greens will be stunning. 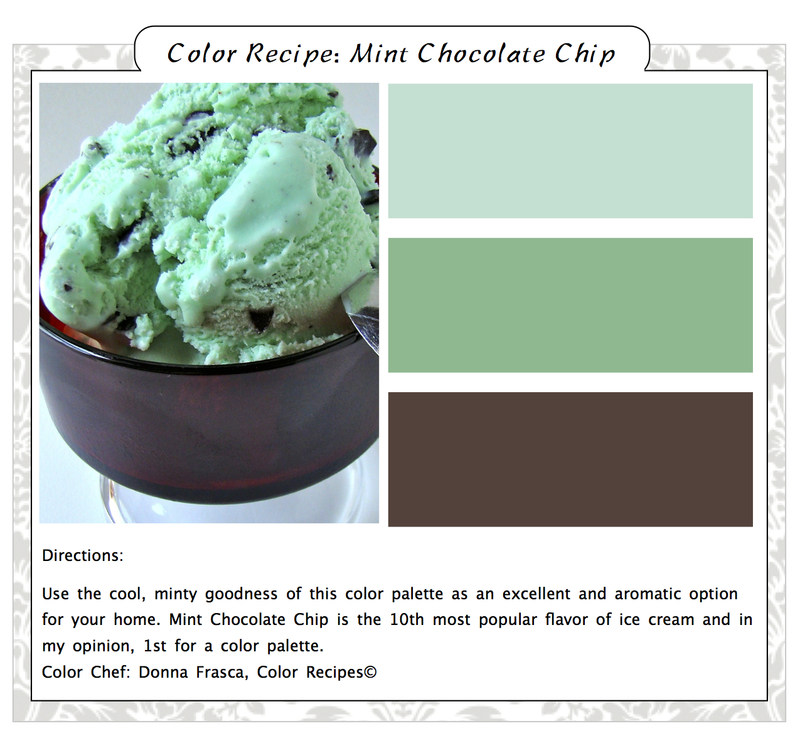 I design Color Recipes when I have time and a few years back I made this card. Isn’t it great? See what I mean about the dark wood flooring and the mint green? Think mint ice cream and chocolate chips, after all, how can you go wrong with that? Q1. Do you think Vintage Mint will be a popular color in the home? If so, which room? Q2. What other colors go with Vintage Mint? Q3. What type of flooring looks best with Vintage Mint? Q4. What about Vintage Mint for kitchen cabinets? Do we dare? 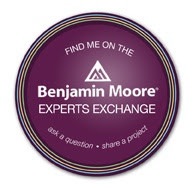 This entry was posted in Color Tips, Color Trends and tagged color feature, color marketing group, color recipes, Vintage Mint. Bookmark the permalink. 1 Response to Mint Green: Eat It Up or Spit It Out?